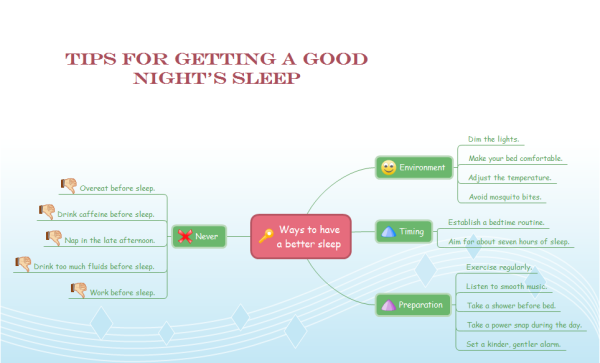 Below is a mind map sample of how to have a better night sleep drawn with Edraw mind map software. Users can easily represent any existing mind map using this customizable template. Better Sleep Mind Map template can save many hours in creating great mind map by using built-in symbols right next to the canvas. You can download and modify this mind map template for your own use. Discover why Edraw is an excellent program to create better sleep mind map. Try Edraw FREE. 1.2 Make your bed comfortable. 2.1 Establish a bedtime routine. 2.2 Aim for about seven hours of sleep. 3.2 Listen to smooth music. 3.3 Take a shower before bed. 3.4 Take a power snap during the day. 3.5 Set a kinder, gentler alarm. 4.2 Drink caffeine before sleep. 4.3 Nap in the late afternoon. 4.4 Drink too much fluids before sleep. You can export the contents of mindmap to Word contents. Click this link to learn it: Export Mind Map Data to MS Word.